Watch brand Oris has released the Dive Control Limited Edition, an evolution of its high-performance ProDiver watch, made for professional divers. The new limited edition watch was developed in partnership with Roman Frischknecht, a Swiss commercial diver who spends his working life deep underwater, servicing the subsea industry. The watch has a 51mm case cast in lightweight Grade 2 titanium and coated in highly scratch-resistant black DLC. 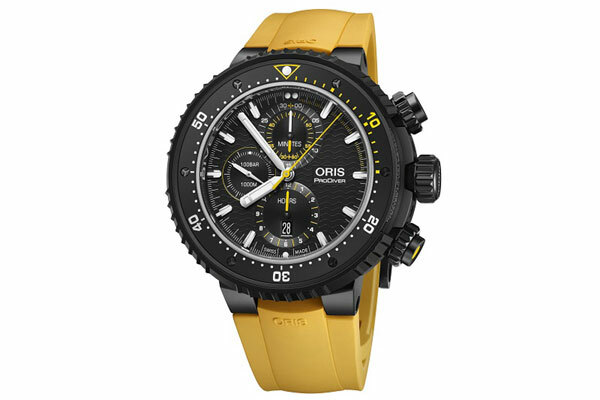 It features the Oris-patented Rotation Safety System, or RSS, a signature Oris device that securely locks the uni-directional rotating bezel in place during a dive. The new watch also features a 60-minute chronograph counter at 12 o’clock, with key detailing in highly legible yellow.